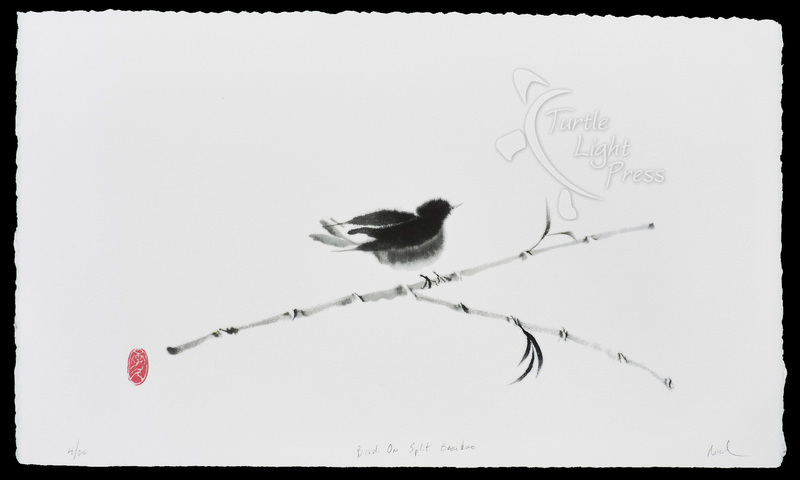 Artist Rick Black works in the traditional Japanese format of only using black ink on various types of Japanese paper. He uses a specially hand-carved seal called a chop to sign and stamp his name in red. 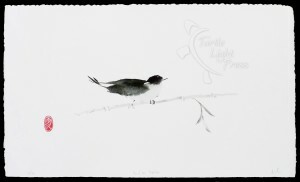 Only two of his paintings have been made into limited editions: bird on bamboo and bird on split bamboo. All of our prints are made on an Epson Stylus Photo R2400 Gicleé printer using the finest archival, fade-resistant pigment inks and acid free papers that have been tested to last for at least 100 years, depending upon framing and exhibition conditions. These limited editions are printed on acid free, ultra-heavyweight 140 lb. cold pressed Arches Watercolor paper with deckled edges and watermarks. An edition of 10 has been made for each bird.